And right now it's a very different kind of propagation! - I'm currently growing baby chickens instead of baby plants! Over the last few months, since a fox decimated my 6 hens, we've really missed them and the beautiful organic eggs they used to lay. I found it hard to stomach the organic eggs I was buying after that, as even though I knew they had to be fed only organic food, they were still nothing like as good as our own. It was clear just from the colour of the yolks that they weren't on a wide enough range, or being fed the amount of green food which I always fed to mine. It's not the fault of the producers however - they have no choice but to keep the maximum amount of stock on the land which they are allowed to under the organic standards, purely in order to make a living. They're certainly not making vast profits! The problem is that most people think all eggs should be a cheap food. They won't pay a realistic price for organic eggs that properly reflects the high standards of production which I recommended should be adopted over 35 years ago, when I was asked for my input into the organic poultry standards here in Ireland. I was told that my recommendations were far too demanding, and that they couldn't be economically viable. But those high standards which I recommended were the way in which I had always kept my poultry. It was also the standard of livestock husbandry which I had grown up experiencing at home - where all of our animals, including our flock of pure-bred Rhode Island Red hens, were kept to the highest standards and greatly valued by my parents, who had gone through the privations of Second World War rationing. They knew, as I do now, that an egg is a perfect meal, chock-full of healthy nutrients, and it should be valued as such! That's why I used to organise 'farm walks' here for my customers, back in the mid-1980's, which were a very popular way to show how organic production worked, and how happy all the poultry were. I knew then, from personal experience, that if customers were educated, and understood the reasons why organic eggs had to be more expensive than conventional eggs, if they knew what went into their production and also the benefits for both our health and for the environment - then they were more than happy to pay a price which more clearly reflected the actual costs and benefits of that kind of production. I simply can't believe that organic egg producers are still only getting the same price for their eggs that I was achieving 30 years ago! How on earth they are making a living at all at that price frankly astonishes me! One of the main reasons I enjoyed selling directly through my box scheme (the first in Dublin) and also at The Dublin Food Coop, was the opportunity to explain to customers exactly why organic food has to cost more - and also how in the long run it works out much less expensive - both for our health and for the planet. Many of those customers are now still good friends, more than 20 years after I retired from organic production, and are all still committed organic consumers, which gives me a lot of satisfaction. Occasionally I even get previous customers phoning to ask me if I have eggs or some other organic product - or where is the best place to buy them if I don't. Anyway to make a long story a bit shorter - this autumn I decided to rear some day-old chicks again. This is something which I hadn't done for years, since I gave up commercial organic egg and chicken production. For the last 15 years or so I'd bought half-grown pullets from time to time - but I wasn't at all comfortable about them having been fed the genetically-modified soya protein, and Glyphosate, or other pesticide-sprayed, ingredients which are in conventional poultry feed while growing, before I got them. Even though after they arrived here, they were fed nothing but organic food, with plenty of greens, and their health visibly transformed surprisingly fast, within a couple of weeks of arriving, I still wasn't truly happy. I knew from past experience though, that rearing them organically from day-old produced far better, stronger hens, which laid eggs for much longer with no problems - even though they were exactly the same breed of hybrid hens used for non-organic commercial egg production. I also knew that the broilers which I used to rear for meat were far healthier, and could be reared to heavy weights of 4kg plus, with none of the joint problems or ill-health which are common in non-organic broiler production. This is because when chickens are organically-reared, they are far healthier due to the nutritious, natural organic feed and a diet which also includes the green food, bugs and worms etc, which they would naturally find when on extensive free-range. They are also much fitter because they have more space to exercise and the freedom to behave as chickens like do, scratching, dust bathing, chasing butterflies etc. - and so are naturally are far less stressed, just like we would be. However, the more I thought about it - the less happy I was with buying day-old female chicks from the only source of them here in Ireland - a hatchery which although good, was routinely discarding the male chicks, which is normal practice for any hatchery providing female laying hens for the commercial egg-laying sector. As male chicks are usually approximately 50% of all those hatched, this means that on average, 50% of the chicks are just wasted! That being so, when I called to order them, I asked if it would be possible to have some of the male chicks, which would otherwise have just literally been thrown away! This is something which I've never done before, and I know that there is a distinct possibility that they won't make much of a chicken - but I feel I must try it purely as an experiment! We've been programmed in recent times to expect a buxom, large-breasted chicken, but whatever they look like, and however skinny they are - they'll still be chicken! As I remarked to my son - whatever kind of chicken they end up looking like - they'll still have skin, liver and bones - upon which he said "Aw..ww.... Mu..m" - having just returned from admiring the seriously cute, day old chicks!... Having reared organic broilers for many years and compared them to the much racier-looking Rhode Island Red cockerels that my father used to rear - I'm realistic and know that these laying hybrids aren't going to look like your average supermarket chicken. But neither will they taste like them either! However little meat they produce - it will taste damn good and will be totally organic - even if it only makes soup! In the far east where chickens originated - they don't look like supermarket chickens either. They race around the jungle doing what chickens naturally do - looking very lean and fit - but they still provide nutritious meat and bones for the people who raise them! My 'skinny hybrid chickens' will have the happiest, most pampered life here that any chicken could possibly have, and when their time to be useful has come, they will be gently removed from their perch in the middle of the night when they're naturally dozy, and dispatched as quickly and humanely as possible - they won't know a thing about it. Perhaps 'skinny hybrid chicken' could become a fashion statement like 'skinny jeans'? A sort of badge of ethical omnivore-ism - to counteract some of the more vile vegan criticism! For me - if they can just make enough of something edible to justify the cost of their feed - then I shall be more than happy and will have proved a point. As an ethical omnivore, eating only higher-welfare organic meat - even if only 2-3 days a week - I believe that a system which discards half of all stock bred simply cannot be justified on welfare, environmental, or sustainability grounds. While organic production generally doesn't have to justify it's methods - I believe that ALL meat production, whether for organic or any other system does. Quite apart from the fact that we should constantly strive to improve standards of all organic production - for animal welfare reasons alone this is something which we must take a hard look at and seriously improve. Anyone who eats meat is now under constant attack from some of the militant, more recently 'converted', what I call 'fashion-vegan' elements of society. While I despise some of the more uninformed 'fashion-vegans' - those who openly don't care about the environment or pesticides (which I find astonishing given that all pesticides are routinely and cruelly tested on animals) - I feel that they do actually have a point when it comes to the case of animals which are industrially-bred, but then routinely discarded as they are considered non-viable for commercial production. When I posted a picture of my chicks with my comment about this on Twitter recently - I was thrilled to discover that there is now a firm in the Netherlands who have very recently started rearing both male and female chicks of a new, dual-purpose hybrid chicken which I hadn't heard of, for commercial, state of the art, environmentally sustainable production. They have just done a deal to provide chicken to Lidl - so it must definitely be cost-effective! Although their chickens are not organic, as they are fed on conventional food waste. I think that this really is something that organic production should be emulating. As long as the chickens have plenty of space to do everything they need to in order to be healthy and happy, as they seem to have in this system - even if they can't be moved constantly to fresh ground as I do my small flock - green food could be grown elsewhere to provide that missing element of their feed. Seeing the pictures of it reminded me somewhat of the system I used to use to raise my organic broilers in one of my polytunnels years ago - but much more hi-tech! The chickens loved lazing around in the warm dry sunshine and venturing outside for a snack whenever they felt like it - it was like the chicken equivalent of the Riviera! Quite apart from anything else - having my new baby chicks has really given me something to look forward to - something which at that at this time of year is badly needed! I was so excited when I was on my way to pick them up in Northern Ireland last week that I almost couldn't bear to go to bed last Thursday night! I was just like a child at Christmas! Everything making up their snug enclosure is recycled. A giant dog cage, which last hosted a rescued hedgehog, lined with the huge sheets of cardboard from the boxes I can't resist saving - (you never now when they might come in handy!)! Bubble wrap which some new furniture for my son's room came wrapped in 4 years ago, and on the top are 2 grow bag trays also helping to keeping the heat in - and they will be filled with some seed trays in the next week or so, to start off some very early seedlings using the small amount of residual heat coming off the top of the cage. This is how I used to do all my propagation years ago - by raising chicks underneath the greenhouse staging every spring - with plants on top! The upper end of the top left bed which the cage is sitting on has already been sown with all my leftover lettuce, mustard and edible green manure seeds, and covered with polythene to help germination, so that when the chicks are old enough to start venturing out beyond the warmth of the infra-red lamp for a few minutes - there will be green food there, which will teach them to forage. All that in the lovely wind-proof environment of the polytunnel. In 6-8 weeks, when they are fully feathered and hardy enough to go out, they will go into the 'Hen Hilton' - as a friend described the re-purposed Wendy house that my son turned into a hen house! Lucky chicks or what? 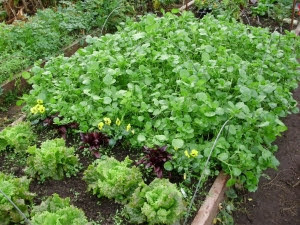 In the meantime, they'll also be manuring the bed which is their 'mini-range' for now, and then that will grow another green manure to recycle their nitrogen-rich droppings and improve the soil more after they go outside. I will love watching my 'Christmas present to me' growing! I could sit watching their antics for hours - especially in the first few days - when like toddlers they try to do all the things that 'grown-up' hens do, like preening their feathers - then wobble and fall over! But most especially - I love knowing that each of the hens will have the best life possible, and provide me with at least 1,000 eggs each during their lifetime of 3 years or more. So our food security is hopefully assured for the next few years! Especially with new reinforced runs and some effectively 'fox-proof', solar-powered electric fencing! The dead and impoverished 'soil' I inherited 38 years ago A lump of that original soil sitting on my soil now - full carbon and of life! There is no healthy life or even a healthy planet without a healthy soil! 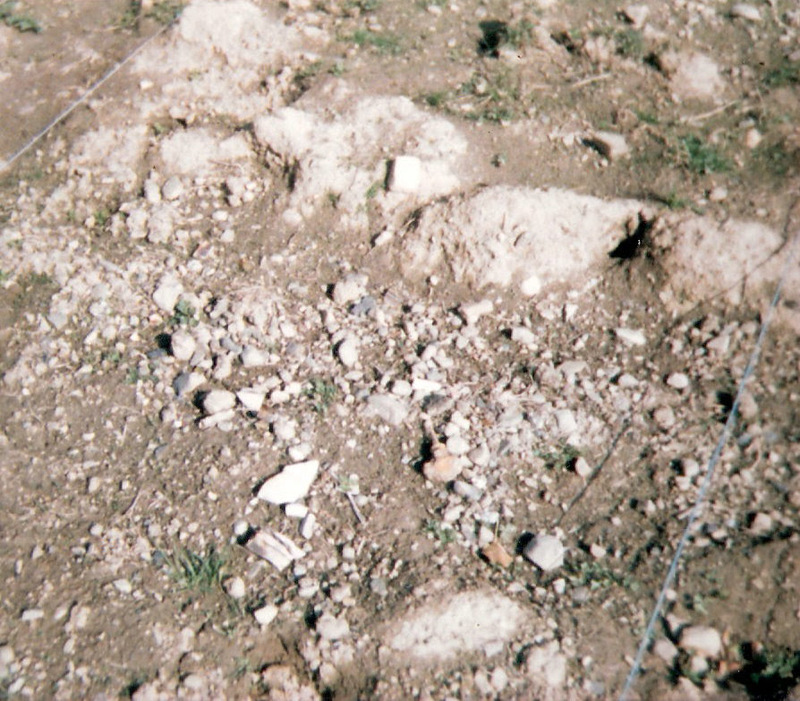 The two pictures above show an example of haw any soil can be healed - even one so badly degraded that it is almost devoid of all life! The picture on the left shows the totally exhausted soil which I started off with here 38 years ago - so badly degraded and impoverished by over 20 years of 'industrial farming' and poisoned with glyphosate and other chemicals - that not even weeds wanted to grow! The picture on the right shows a lump of that very same soil, which I had carefully saved an example of, sitting on a bed of the soil which I now have - a vitally alive, healthy, carbon and humus-rich soil full of the vital microbial life that keeps both plants and humans healthy. I knew by the time we moved here - from my own seven years of organic gardening and also by watching how Nature works - that soil can be restored to healthy life gradually by feeding it with natural plant wastes and composts. I'm not superwoman, I'm now partially disabled and don't have any help here. It won't take you 38 years - it can be done! And from the moment you start to heal your soil you will become part of the solution - and not part of the problem. The health of the entire planet - as well as the health of all biodiversity including humans - depends on a healthy soil. Without a healthy soil - we cannot grow healthy crops full of the vital nutrients which we evolved to eat to keep us healthy. The enthusiasm and energy from all of the people who attended was infectious. A wide diversity of environmental groups were represented - not just organic farming organisations. I sincerely hope that they will all go on and continue to spread the awareness that soil is not just essential to growing healthy food for us - but also that restoring soil carbon, by regenerative organic farming methods, is absolutely key in helping to mitigate climate change. In the last 35 years we have lost approximately 30% of our soils globally, mostly through the destruction caused by intensive chemical agriculture. Felling forests, drainage and destruction of wetlands is also not just adding to this loss of carbon-fixing humus but also causing emissions of even more carbon dioxide and methane into the atmosphere. As the living soils in forests and peat bogs are major carbon sinks, this is having a massive effect on accelerating climate change. But there is hope that we can do something and this is what I wanted to get across. We can ALL do something - and we all should act now - without delay! The well-known and highly-esteemed soil scientist Rattan Lal, from Ohio State University estimated a few years ago that just by restoring 2% of global soil carbon - we could mop up ALL of our current greenhouse gas emissions from whatever source.... What a stunning statistic! Regenerative, sustainable organic farming and growing is the ONLY method of agriculture which can do it. Just putting back some plant wastes into soil but still continuing to use fossil fuel-derived, soil-destroying chemicals can't do that. A combination of the two simply doesn't work, as one will cancel out the other! Agricultural chemicals destroy the soil life which is vital to making carbon-fixing humus in the soil. In addition - using chemicals literally 'mines' carbon from the soil and also depletes it of many nutrients which are vital to our health and that of all other creatures. In 1963, the late Rachel Carson - author of Silent Spring and heroine of the environmental movement said "I truly believe that we in this generation must come to terms with Nature, and I think we're challenged as mankind has never been before to prove our maturity and our mastery, not of nature - but of ourselves." - Sadly too few heeded her timely and much-needed warning. The lure of chemical farming and cheap fossil fuels proved too seductive. We thought had it all - and like irresponsible teenagers we squandered the riches of our Mother Earth to the point were in many places soil can no longer do the job it evolved to do - which is to sustain healthy life on this planet.....But like irresponsible teenagers we now have to grow up, prove our maturity and urgently take responsibility for our actions! In the autumn of 1992 - just after the first Rio Earth Summit - I organised a lecture at the National Botanic Gardens which was given by Alan Gear - who was then Chief Executive of HDRA - now called Garden Organic, which the largest organic gardening organisation in Europe. His lecture was entitled - "The Road From Rio". His warning was again stark - that we ignore the value of soil at our peril! Hearing his motivating talk, many of us were re-energised and went home determined to do whatever we could to help raise awareness of how valuable soil is and what a vitally important contribution organic farming could make to a more sustainable future. Not just for growing healthy food but also in mitigating climate change. A lot of people talk about climate change now - but actually do nothing to help mitigate it! As a 'doer' and a practical person not a philosopher - I went home from Alan Gear's lecture and planted 300 more trees - many of them biomass willows, oaks, hawthorns, hornbeam and birches. I'm so glad I planted them - and a lot more since. They've been so useful for shelter for animals and plants, for fuel and for making soil-healing compost from the smaller prunings. They're also a wonderful year-round resource - hosting biodiversity of all kinds - bees, insects and other creatures so vitally important in the connected web of life. If you only do a couple of things for our children's future and for the planet - please plant a tree or two, use peat-free compost and try to support organic agriculture if you don't have somewhere to grow your own organic food. Don't put it off until tomorrow - do it now! I know organic produce isn't cheap - but the more people who buy it the cheaper it will become and the more governments globally will sit up and take notice! Consumer power works! Ultimately - only climate-friendly, carbon-restoring agriculture will be able to help to combat climate change. We cannot go on mining the remaining carbon from soils and replacing it with fossil-fuel derived, climate-destroying chemicals which worsen the problem even more. Intensive farming is costing us the earth - quite literally! Fast forward over 50 years since Rachel Carson's dire warning....and the words of Rattan Lal give us hope that we CAN do something to avoid total catastrophe - and that the answer to doing that lies in the soil. But only in a healthy, living soil. It's no good us burying our heads in the sand and saying that it's all too depressing, there's nothing we can personally do, so we'll just go on ignoring it as usual! That's a mistake! It's no good either just "talking the talk" without "walking the walk" too! The soil that gave us life and nurtured us holds the key to our past - and the evidence of may past civilizations who didn't heed the warning signs of impending disaster........that soil also holds the key to the future of life on this beautiful earth as we know it.......and THAT KEY is now in OUR hands! Trying to reduce our carbon footprint can begin at home - because we all have to eatl! We can't turn back the clock - but we CAN ensure a future infinitely better than it otherwise will be if we do nothing. I know that as gardeners or even just as consumers we can all do something. Act globally but think locally is the mantra of the Green Party. As co-founder of our local Fingal Green Party - that has always been my mantra too, and being a practical person - I find it helps to physically do something when I'm stressed-out from worrying about bigger issues which I can't personally control. Organically-managed soils have massive potential to capture and store carbon - and the more we support organic agriculture - the greater the chance is that our children will have a viable future on this planet, which is the only home we have. I believe that if only half the resources had been put into inventing technology to deal with the challenges we face with climate change that have been put into space exploration - we could have halted the steep rise in the greenhouse gases and already have the problem if not fixed - then at least it's rapid progression halted. Instead of that scientists seem increasingly fascinated by childish fantasies of space exploration. (Landing on Mars is a total denial of the problems we face while the world is burning up - quite literally as the disastrous fires in California this year proved). So - back to every day practicalities! Last Friday, Gerry Kelly was here to record our Christmas edition of From Tunnel to Table - and we unearthed a couple of pots of the 'new potatoes' which I grow each year for a special Christmas treat! The results are pictured below - and my mouth is watering at the prospect of these smothered with butter, with our Christmas meals! They'll definitely lift the winter gloom! At the moment - some days are so gloomy that they barely seem to get properly light at all. Despite this, as you can see - there are still lots of lovely 'squeaky-fresh' vegetables to pick in the tunnel beds - or even just growing in containers - as you can see from the pictures here. One of this year's beds of luscious loose-leaf winter lettuce Home bred purple kale hybrids & Sugar Loaf chicory. I don't know why more people don't grow at least a container or two of mixed leaves, even if all they have is a balcony or windowsill. It's so easy if you choose the right varieties - and it needn't be very expensive. Mixed salads or lettuce mixes are always the cheapest seeds - you get far more for your money - and you can grow in almost anything that will hold compost once it's deep enough for the roots! You don't need to fill it right up with expensive peat free compost - save broken polystyrene or plastic plant trays, or even tougher un-rotted plant remains from your compost heap, and fill up the bottom with those. They'll give you good drainage as well. Most salad plants are very happy with just 10 - 12 inches of good compost to put their roots into as long as you keep them sufficiently watered. You can mix some soil into the lower layers as well - which gives the compost more water holding capacity and makes it cheaper again! When you compare it with your outlay - even just one or two meals would easily more than cover the cost of doing it! Make an early New Year's resolution for 2018 - and if you're only a summer gardener - then vow to make next year the year that you will have salads all through the winter too. Brussels sprouts and parsnips may be delicious comfort food from outside I grant you - but somehow they don't feel quite as vibrantly bursting with health as a salad picked five minutes before you eat it! I look forward to mine every day. Planning ahead and remembering to sow winter veg. in August and September is often difficult to remember while dealing with summer gluts, but it really pays off now. Loose leaf lettuces, chicory, chards, spinach, kales, watercress, lamb's lettuce, Chinese leaves, rocket etc. are all really useful winter salads that I'm cutting now. What isn't quite perfect for the table - the hens get - which keeps them healthy and laying eggs with lovely orange yolks all winter! I would never want to be without my winter tunnel crops - you can really feel the crisp, green lusciousness doing you good! Vegetables that are often taken for granted in summer because they're plentiful, become treasures to be relied on in winter! It's so nice to be able to go out and 'pick & mix' a really varied salad every day - sort of 'dowsing' the salad beds to see what feels just right for you on that particular day! There are only pathetic organic salad or spinach bags in the shops right now and - at the moment it's mostly just baby spinach which is tired, several days old and often already practically composting in the bags! Frankly, I can think of far better ways of spending €3! Lately my daily salad of choice has always included watercress, - which is full of healthy phytonutrients and goes well with everything. When I walk into the tunnel the watercress seems to just be screaming - "me...me...I'm the best choose me!" - it always looks so vigorous and lush. Very few people seem to grow watercress over the winter in the tunnel - although it's easy and incredibly productive. It grows very easily from seed or cuttings, grows very quickly once it gets going and just needs a constantly moist spot to thrive - even in shade. If you can find any really fresh bunches in greengrocers shops or in supermarket bags, then it's well worth trying from cuttings - that way you'll get plants a lot faster. Pinch the lower leaves off, then put the stems into a jar of water on the warm kitchen windowsill for a few days, where they should produce some fine white roots very quickly. You can then pot them up in pots or plant into the ground in your greenhouse or tunnel and keep them well watered - just covering with fleece if hard frost is forecast. Remember that watercress is a member of the brassica (cabbage family) - so take that into account in your rotation plan. As you can see here - it will even grow happily in tubs if well watered! An indispensable plant. Not only fast-growing but also one of the most nutritious salads you can eat! Watercress is far higher in important phytonutrients than winter lettuce. 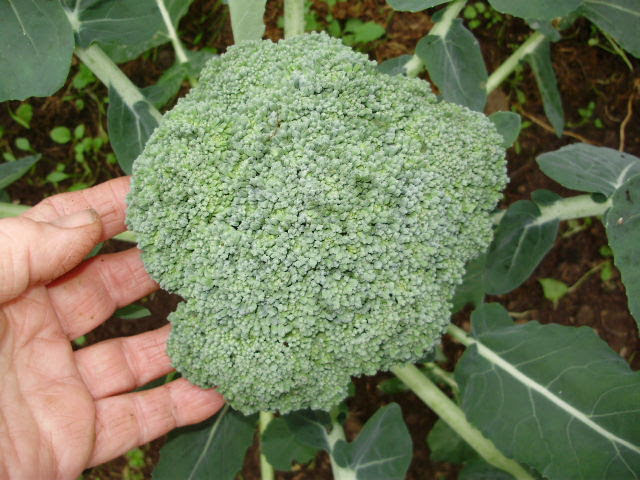 Like all members of the brassica family - it's chock-full of healthy nutrients - iron, Vit C and phytonutrients like sulforaphane (proven to be active against cancer) and incredibly good for your health. It's recorded that the Greek physician Hippocrates even sited his clinic beside a stream in order to take advantage of being able to grow watercress in the water. He must have known something - as it was he who coined the phrase "Let food be thy medicine and let medicine be thy food" - and I'm a great believer in that. There is a common misconception that you need running water to grow watercress - but you actually don't! Just never let it dry out and it will be very happy. It's also great to grow in the polytunnel in the winter as it doesn't mind the damp atmosphere - which can kill other plants like lettuce. In fact it loves the damp and grows so thickly that it blocks out light too - not allowing any weeds a chance! Unlike among the wider spaced lettuce where the generally mild autumn here has encouraged determined self sown claytonia seedlings to keep on coming up between the more widely-spaced plants! It's really important to keep on top of weed growth at this time of year because even just a few low patches can really restrict air circulation. Weeds like chickweed in particular can hang onto moisture and encourage disease in vulnerable plants like lettuce. So keep your winter tunnel salads well weeded. 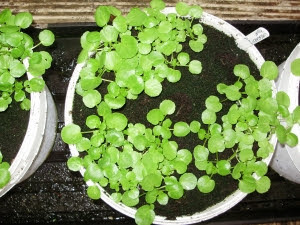 Young watercress plants grown from cuttings, in recycled buckets on a grow bag tray. Easy to ensure they don't go short of the moisture they need to grow well. Keep ventilating the tunnel every day for at least a couple of hours if you can to avoid moist stagnant air building up - air circulation is really important to avoid diseases. Watercress is the only crop which I make sure is kept really moist at the roots at this time of year. There's barely any other watering to be done now in the tunnel - but if you think the soil looks very dry - then just scratch around just under the surface with the tip of your finger - you'll often find that it's moist enough there so needs no water. But if it feels really 'dust' dry - then just dribble a little water between plants like lettuce etc., being very careful not to go close to or splash plants, as this can cause rotting very quickly. I's also a good idea to keep an eye on the weather forecast and try to water on a day when it's forecast to be milder for a couple of days. Don't drench anything though - as with low light levels and cold temperature at this time of year things are growing very slowly and won't use it. If they're sitting in cold wet soil their roots may rot, or stems may rot at soil level. Gloom at 3pm in the polytunnel - looking a bit like a theatre set with the curtains drawn back! 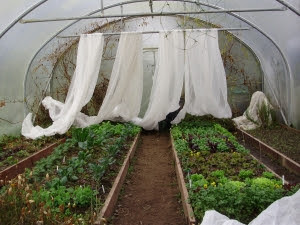 I suppose to some it may seem like quite a lot of faffing around, uncovering the salad beds in the tunnels in the mornings and hanging up the fleeces on the crop support bars to dry! But when you get into a routine - it only takes about 10 minutes or so and it's well worth doing when temperatures are very low. The fleeces can get very wet on some nights and left on all the time would stop air circulation, encouraging more damp air and possibly causing grey mould and rots. I use a very blunt ended bamboo cane, a bit like a long arm, to help lift the opposite side of the fleece up, wind it up and then to push the ends up and hang them over the crop support bars - as it's impossible for one person to be on both sides of the bed at once! If it's been a very cold night I wait until the tunnel temperature comes up to about 1 deg C before I take fleeces off. I put the fleeces back on again in the afternoon about 3 pm at the moment - closing the tunnels before temperatures dip and frost sets in. 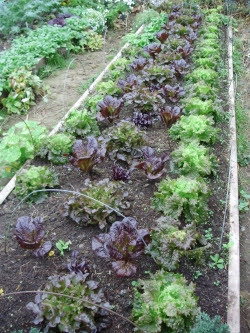 I know it's a bit of trouble but if you're at home anyway and can do it - it really makes a huge difference to what will grow well over the winter, lettuce in particular really appreciates it. Things like lamb's lettuce, claytonia and land cress don't really need it as they're very hardy - but everything grows so much better for that extra bit of TLC! Such a lovely sight greets me when I uncover the beds - it does my heart good to see so many healthy and colourful things growing so beautifully when it feels like the North Pole outside! It's almost like unwrapping a Christmas present every day - and it definitely is the best present you can give to your health, eating a good mixture of raw green leaves every day! I use old cloche hoops to rest the fleeces on which suspends them slightly over crops. I find doing that gives much better air circulation - and it the weather's really Arctic I can put a double or even triple layer on without weighing the plants down. Our weather may soon possibly turn a lot colder - there's possible snow forecast for higher ground the end of the week! It was this week in 2010 that we got the last spell of serious snow - and although there's only light snow forecast for the North in odd places and frost down here at the weekend - it's as well to be prepared! If we do happen to get snow - it's really important to keep gently clearing as much snow as possible off tunnels, because if it's allowed to build up too much and it becomes heavy - the weight of it could split the polythene or even make the tunnel collapse! Remember gently is the watchword - polythene is much more brittle when it's very cold, particularly if it's a couple of years old. Late morning to midday seems to be the best time, because it's the warmest (ha!) time of the day inside the tunnel and it will slide off fairly easily then. 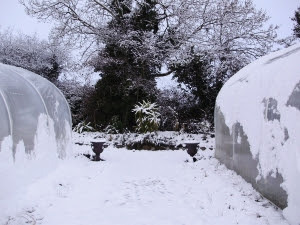 I shall be happy if we get just a little snow sometime during this winter - because couple of years ago I discovered it's a very effective way of cleaning algae off the tunnels! As it slips down it scours the algae off - leaving the polythene sparklingly clear! You can encourage it by using a very soft, long handle cobweb brush. It's the only time one gets used in this house! I bought it specifically for clearing tunnel snow! If you're desperate for a gardening 'fix' and want to try a few giant onions, shallots or leeks for some early crops or whoppers for next autumn's flower shows why not try sowing a few if you have somewhere warm to germinate them? It would be a waste of precious energy to use a propagator now - but they'll only need about 55/60 deg.F or 10/15 deg.C. After germination they'll be quite happy growing on quietly as long as you can give them above 45 deg.F or 7/8 deg.C with good light, protected from frost. A bright windowsill in the house is fine as long as it's not too cold, remember to turn them every day - so they get an equal amount of light on all sides and also remember to bring them inside the room before you close the curtains at night, so they don't get chilled. Another trick you can use is to fix some tin foil around one side of the pot, using a couple of small canes or barbecue skewers to fix it to so that it reflects the light. Most plants don't need very high temperatures - but they do need the very best light you can give them. If they get 'drawn' and spindly they're much more susceptible to disease. Sow them thinly, spacing them out if possible, and don't over water. In about 4- 6 weeks or so you can prick them out individually into small finger pots or modules, planting out at the end of March when they're growing strongly - or even earlier in the tunnel. Even if you don't want to enter competitions - you'll still have some really early! Good housekeeping keeps down disease - so keep clearing up any rubbish! As I mentioned earlier - this is particularly important at this time of year - keep clearing up any dodgy looking, mouldy, or dead and rotting leaves the minute you see them - to keep diseases at bay. Open the doors and ventilate for a few hours every day if at all possible. Even at this time of year air circulation is really important - it helps to keep the atmosphere inside from being too damp which otherwise would encourage disease. Keep a sharp eye out for those nasty little grey slugs too - there's nothing more disappointing than finding that a perfect looking lettuce is filthy and slug ridden inside! They tend to be braver in winter as the low light fools them into thinking it's dusk! Putting a few pieces of broken slate at various spots along the beds always traps them as they think they're safe hiding under those! Snip them in half or throw them to your hens if you have them - they really love the extra protein! My hens always inspect everything for slugs first before starting on the 'side' of green veg when I throw them any scraps from the tunnel! Or chuck them outside the tunnel to take their chance instead! - Well it is the season of goodwill after all - but any hungry birds will be quick to spot them too! As I mentioned earlier - if you planned well back in midsummer - you should have plenty of salads, chards, kales and celery etc in the tunnel now for the winter. It's very easy to forget that winter veg does grow a lot more slowly, so you need far more of each plant for a continuous crop than you would normally plant in the summer. At least 3 times as much I would say. It's often something one only learns from experience though. When I started my 'organic box scheme' 35 years ago (the first one in Dublin), one of the first things I learnt from experience was that you must plan well - in order to have something available for customers all year round. If you don't they go somewhere else! I know it seems a long time away - but if you leave it until midsummer, you may not be able to get many of the varieties you want even by mail order, and most of the garden centres take out their seed displays in July. So when you're doing your seed orders in the next few weeks, think about next winter's veg too! Looking after biodiversity is important - even in a polytunnel! The tunnel is a lovely sheltered place to sit and relax and get one's recommended daily 20 mins of daylight - even in the very depths of winter. Particularly if all the cheery Christmas crowds and constant 'muzak' get a bit much! Definitely 'in heavenly peace' I can't bear shopping centres at Christmas - or in fact at any other time! At midday on a frosty but sunny day one can almost believe it's spring - with a few winter pansies, cyclamen, primroses or perennial wallflowers in full bloom, wafting their scent around you - and the birds singing while waiting for their turn on the feeders just outside the doors! Hellebores in pots are already flowering. I have my chair arranged so that I can watch their antics. A robin always appears hopefully as soon as I venture inside - he's expecting me to start hoeing! Growing mini-gardens full of wildlife friendly flowers and herbs at the ends and in the corners looks lovely and doesn't cast any shade on crops. It creates a far more natural environment - attracting in all manner of beneficial creatures. A couple of days ago on a still, mild day - there was even a brave bumble bee in there - so I was glad there were some flowers for her. Adventurous bees are so grateful for any winter flowers. Putting an old upturned clay pot or a pile of stones in various spots, with a shallow dish of water or even a mini-pond will attract frogs too and they will often hibernate in the tunnel. They love shady damp places, and seem to just appear from nowhere! They're great for eating the tiny grey slugs which ruin lettuce hearts. A pile of stones will give cover to ground beetles too - also voracious small slug hunters. I often find Devil's coach horse beetles in my 'mini-cairns' - they are fierce predators too. You'll just be amazed at the amount of beneficial wildlife these mini-gardens attract! Even in my smallest tunnels I always did that because it really helps to make a huge difference in controlling the pest population. Small birds like Dunnocks, Sparrows, Robins and Wrens often spend hours in winter hunting around the edges of the tunnel - they don't mind me and I love to see them in there being busy too. It's fascinating being able to watch them closely - and it really makes you appreciate them even more. I see the space just inside the doors wasted in so many tunnels. That space should be working for you - just like every other inch! Why not think of planting a grapevine or a kiwi fruit next year to train up and over the door. I love my Lakemont seedless grape arch and it's so productive in space that would otherwise just be empty! Many people lose interest in the winter and leave their tunnels full of the sad, dead and disease-ridden remains of last summer's crops! Doing this is just storing up trouble for next year! A tunnel or greenhouse is a very expensive investment - every possible inch of it should be used positively and productively all year round! Lastly - one of the most important items to have in a polytunnel is the comfortable seat in a sunny spot at one end! There, you can sit and make plans for next year - dreaming of all the abundant and delicious riches to come - snug as you like in the winter sun! Who needs a carbon-guzzling expensive winter sun holiday when you can have a sunny and productive polytunnel instead? - Not me! !